Data provides the tools and common language for reflection, analysis, and decisions across all stakeholders (students, parents, teachers, and leaders). We utilize a number of assessments to evaluate student learning, teaching, and necessary supports, and we use a structured approach to engage with the data to monitor progress. 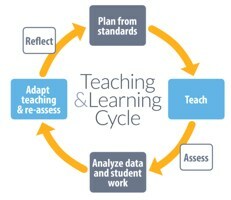 We employ a cyclical approach to data collection, analysis, and action at every level and leverage professional development and collaborative team structures (grade teams, content teams, leadership team meetings) to regularly review and respond to data.